At Native Trails, we’re best known for our hammered copper sinks, but since we introduced our NativeStone® concrete sinks we haven’t been able to get concrete off the brain. It’s one of the most interesting trends in design—showing up all over the home—indoors and out, on floors, on walls, in kitchens and bathrooms. There’s lots to love about concrete—not only because it checks so many green-friendly boxes, as it optimizes energy performance, conserves natural resources, and can be made locally (often right on the job site)—but also because it’s so versatile and is usually custom-made, allowing lots of room for artistry. Julien De Smedt, an architect who lives in a Brussels pad that he clad largely in concrete, told Dwell recently, “It puzzles me why more people aren’t into concrete—it’s the most practical material. It’s warm, if you do it right. And you can clean it in about two seconds.” De Smedt and many other designers, architects, and taste-making homeowners are leading the charge toward all things cement. Concrete homes are faster, greener, and more affordable, both in the short-term (to build) and for the long haul (to heat and cool). Because they’re fortress-like, concrete homes are also considered more durable than wood-frame homes. Numerous ever-evolving technologies are used to put up concrete homes—including buzzed-about construction systems like ICF (Insulated Concrete Forms) and CIP (Cast in Place), and while some builders fully embrace concrete’s cool, gray modern aesthetic, others design their concrete houses with all the traditional architectural bells and whistles. Once found only in outdoor applications, concrete furniture is showing up far more often in the home and office and in the catalogs of mainstream retailers like Restoration Hardware and CB2. We’re big fans of an imposing concrete conference table or concrete dining table. Concrete also works beautifully as a media console, bookcase, desk, or coffee table. Concrete countertops, which are typically custom-crafted on site, may actually run homeowners more per square foot than granite or even marble countertops, according to concretenetwork.com. This is attributed not to material costs but to the time and artistry required of the installer. Concrete countertops can be made in irregular shapes, with custom edges, and with accompanying backsplashes or integral drainboards. Also taking off as a DIY project, some impressive concrete countertops have resulted from the ferocious DIY efforts of top bloggers like A Beautiful Mess and Little Green Notebook. Concrete vanity tops are also widely popular. These concrete counter tops specifically for the bathroom can be found in standard sizes, which keeps the cost down and means they are easily available. When we rolled out our line of concrete sinks, we didn’t do so just to satiate a growing appetite for concrete trough sinks, concrete vessel sinks, and other concrete basins – our NativeStone Collection was designed specifically as an improvement upon typical (if you can call any concrete sink “typical”) concrete sink production methods. We came up with a process that makes our concrete sinks refreshingly practical – durable, stain-resistant, and lighter in weight. Thanks to the addition of jute fiber, a rapidly renewing natural resource, a NativeStone sink is 40 percent lighter than the average concrete sink. This is a fact that is very appreciated during sink installation and while tallying shipping costs. Meanwhile, our state-of-the-art nanosealer makes the sinks compulsively touchable, very durable, and impervious to stains. 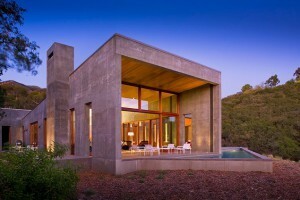 We’re happy to say that Native Trails’ place in the concrete trend is cemented. Learn more about NativeStone concrete sinks.